"A hat created to celebrate the partnership campaign." 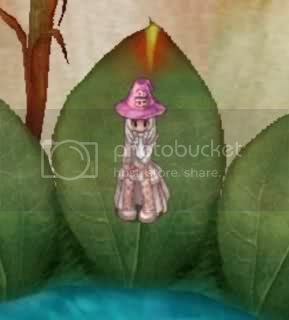 Take these items to NPC Flick, shown below, who is located at mystic_shop 127 205 to obtain this headgear. 1The Mage Hat requires: 1 Yellow Potion (Item ID# 503), 1 Wizard Hat (Item ID# 2252), 400 Dragon Scale (Item ID# 1036), 50 Mould Power (Item ID# 7001), and 1 Elder Willow Card (Item ID# 4052). Take these items to Tempestra who is located at alberta 135 79. Give her the Yellow Potion and she'll make your hat.